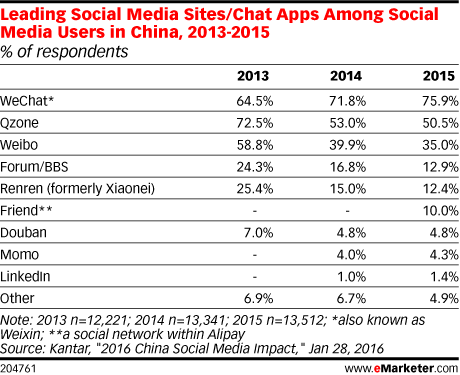 Data is from the January 2016 Kantar report titled "2016 China Social Media Impact." Data in the report is established based on a CTR Market Research survey of 13,512 internet users in China conducted online during December 19-27, 2015. Data is also based on surveys from Global TGI. 11,224 consumers ages 12-64 in Brazil living in 9 major metropolitan areas and interior Sao Paolo were surveyed face-to-face and via self-completed survey during February 2014-January 2015. 54,052 consumers ages 15-69 in China living in 60 tier 1-4 cities were surveyed face-to-face and via self-completed survey during March-August 2015. 15,397 consumers ages 15+ in France were surveyed face-to-face and via self-completed survey during January-December 2014. 24,821 UK consumers ages 15+ were surveyed face-to-face and via self-completed survey during April 2014-March 2015. 10,005 US internet users ages 18+ were surveyed online during February-April 2015. The survey conducted by CTR Market Research has a sampling error of +/-0.8 percentage points with a 95% confidence interval. The report defines tier 1 cities as Beijing, Guangzhou, Shanghai and Shenzhen, tier 2 cities as Changsha, Chengdu, Chongqing, Dalian, Foshan, Fuzhou, Hangzhou, Harbin, Jinan, Nanjing, Ningbo, Qingdao, Shenyang, Suzhou, Tianjin, Wenzhou, Wuhan, Wuxi, Xiamen, Xian, tier 3 cities as Changchun, Guiyang, Haikou, Hefei, Kunming, Lanzhou, Nanchang, Nanning, Shijiazhuang, Taiyuan, Urumqi, Zhengzhou and tier 4 cities as Anshan, Baoding, Changzhou, Dongguan, Huizhou, Hohhot, Jiangmen, Jinhua, Leshan, Mianyang, Nantong, Quanzhou, Shaoxing, Tangshan, Xiangfan, Xining, Xuzhou, Weifang, Weihai, Yibin, Yinchuan, Zhaoqing, Zhongshan and Zhuhai.